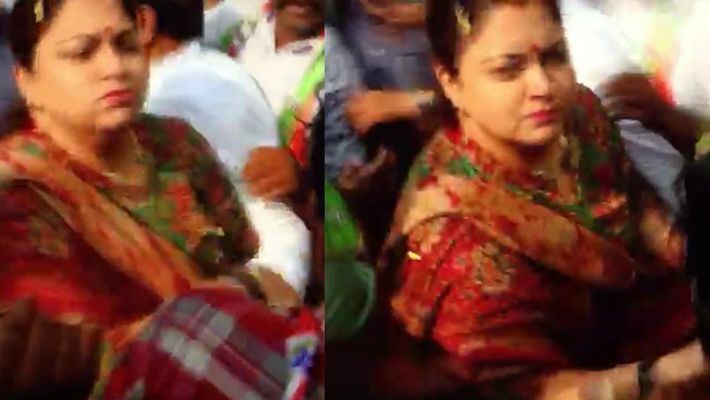 Khushbu Sundar slapped a Congress party worker while she was campaigning for Rizwan Arshad with Shantinagar MLA Nalapad Ahmed Haris in Bengaluru on Wednesday, April 10. Bengaluru: A video of south Indian actress Khushbu Sundar in a Congress party rally in Bengaluru has gone viral. Sundar was in the city to campaign for Congress-JDS alliance candidate Rizwan Arshad yesterday, April 10. Many fans and party workers had gathered near Rizwan's residence to get a glimpse of the star. The video shows Khushbu with Rizwan and Shantinagar MLA Nalapad Ahmed Haris heading towards a vehicle in order to proceed towards the rally. A youth from the crowd of supporters allegedly misbehaved with Khushbu, which prompted her to slap him. A policeman immediately pushed the Congress party worker back. The incident was captured on video. The video, however, does not offer any clarity on the alleged misbehaviour of the youth. However, a few minutes after the ugly episode, Khushbu retweeted the post of Sagay Raj P, who shared the video and wrote, "This is called Kapala Moksha in Kannada. @khushsundar slapped a man who tried to misbehave with her while campaigning for Bengaluru Central Candidate. Even a few lady reporters who are subjected to this kind of harassment should learn from Kushboo. #LokSabhaElections2019"
Speaking to media, Congress candidate Rizwan said that Khushbu slapped him because he misbehaved with her. He also explained that such mishaps are common when thousands of people are gathered in one place. He added to his statement saying that he had asked the city police to take action against the party worker who misbehaved with her.